What do Peer Mentors do in a usual week? Peer Mentors hold office hours weekly for walk-in appointments and are available to answer questions from students. In weeks where events are held, peer mentors will work during their office hours to produce and distribute flyers promoting the event, and may work as student representatives/ambassadors at events designed to present the school to potential and future students. What are the advantages for students of becoming a Peer Mentor? Peer Mentors are routinely rewarded with the positive feedback that helping others provides. Peer Mentors also receive leadership training, gain experience organizing events, moderating panels, networking and collaborating with a diverse group of students, faculty and professionals. As a Peer Mentor, you will also be able to take advantage of professional opportunities that will help you present yourself to your best professional advantage. How many events do Peer Mentors organize each year? This will vary each year, however the Peer Mentor program routinely sponsors 2 – 4 events each semester and assists the School of Science in publicizing official School of Science Professional Development events. The program’s signature events, “Career Choices Round-table” and “Is Graduate School Right for You?” panel are annual events. Some Peer Mentors will offer assistance during Orientation, Open House and Mondays at Monmouth and other events throughout the academic year and summer sessions. Do I have to attend all Peer Mentor-organized events to be a Peer Mentor? While it is always best to fully participate in all of the activities, the short answer is ‘no’. Certain events are essential, however, and attendance these is mandatory, including the planning meeting scheduled for the first Friday evening of each semester and Career Choices Round-table, the group’s premier event. Attendance is discussed during the interview and then again during planning meetings (first Friday of the Semester) so that the group’s activities will be fully-staffed, allowing the program to work at optimum level. What kinds of compensation will I receive as a Peer Mentor? Peer Mentors are paid an hourly wage. In addition, program director Dean Duckett will provide prompt and detailed letters of recommendation for all Peer Mentors when requested. Thoughtful and comprehensive letters of recommendation are an invaluable tool in pursuing your graduate school, research or employment goals. The Peer Mentor Program also has two social events for mentors every semester. 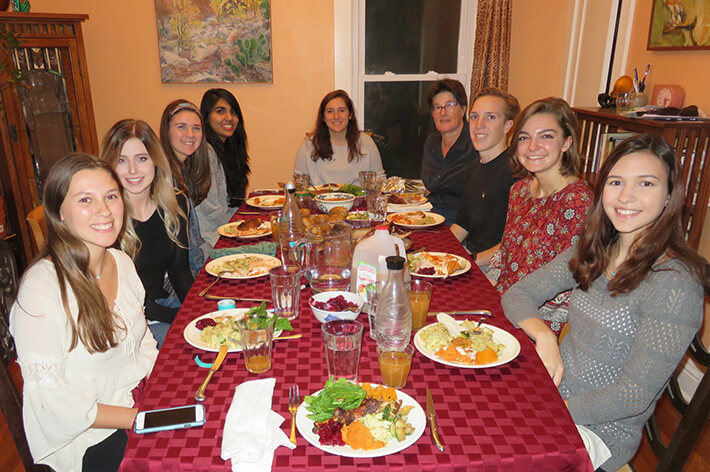 Last year we held a ‘Friendsgiving’ at Dean Duckett’s (see below) and a lunch welcoming new Peer Mentors in the spring. These are not exactly compensation, but most Peer Mentors enjoy them.